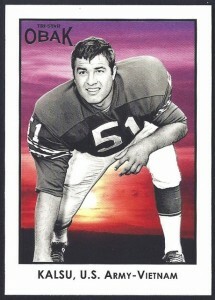 James Robert “Bob” Kalsu was an offensive guard at the University of Oklahoma when he was drafted by the Buffalo Bills in the eighth round of the 1968 AFL-NFL Draft. He earned himself a position in the Bills starting line up in his rookie season, and played in all 14 games during the 1968 season. 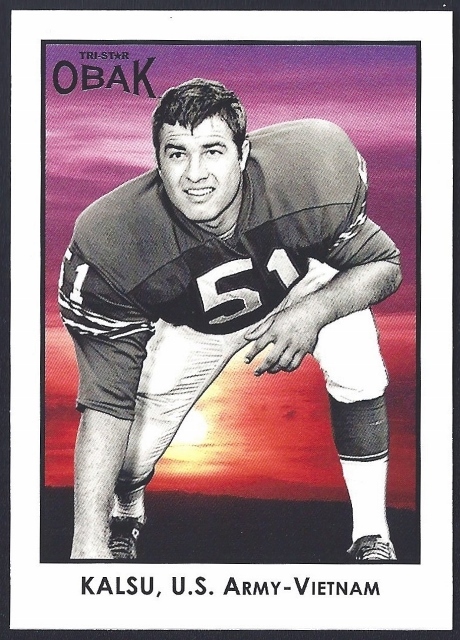 Following his first season in professional football, Kalsu entered the Army to satisfy his ROTC obligation, and found himself in Vietnam as a member of the 101st Airborne Division in November, 1969. In the summer of 1970, Kalsu’s unit came under enemy mortar fire at FSB Ripcord near the A Shau Valley. Bob Kalsu was killed in action on July 21, 1970. Mr Kalsu should be in the HOF for being a man who did his duty! My wife’s cousin’s proper name is James Robert Kalsu and he was a very good person as were the other 58,000+ men that died in war. Correction made, Jim. Thank you for visiting the site.